Recently someone said something to me that was so insensitive and thoughtless it caught me off guard. Although maybe that’s because I’ve lowered my guard in recent months. Most people mean well but say the wrong thing simply because we are a grief phobic society and aren’t taught what to say or do in this situation. I’m posting this in the interest of education so you don’t have to cut off your foot to remove it from your mouth. And just so you know, most W’s will just nod and let it go, even though you just hurt them deeply. You must really miss him and think about him all the time and wish he was here to talk to. Okay Captain Obvious, I’m sure this is just an example of words bypassing your brain to exit your mouth, but please take a moment to think about what you are actually saying. Talk about rubbing lemon juice in that healing wound. Wow, has the last year been hard for you? Seriously? The answer, of course, is yes. But why would you ask someone that, especially if they are out and about? Some days it’s a real struggle to be with people, and this is the reason why. Do you have plans to date again? This was actually said to me shortly after diagnosis while I was still married to a very alive, and fighting to stay alive, husband. WTF! God has a plan. Um, I try really hard to be understanding, but F@#$ you! It’s really best to keep your useless pseudo-religious platitudes to yourself. Do not ask for details of his final moments. WTF! She’s reliving it anyway without your help, don’t make it worse by dredging up the worst moment in her life. Oh my God. What will you do? NOT HELPFUL! Please count to 10 before speaking to give yourself time to evaluate the words you are going to say. Dan would/wouldn’t want you to__________________. Really? How the F would you know? If you have a phone line to him and haven’t shared it before now, this normally peace loving woman will cut you. I wish I could take away the pain. I know nothing I can say or do will make this better, but I’m coming over anyway. Only come over if you have the close relationship that allows for this. Coming over to gawk at the train wreck when you are only acquaintances falls under the WTF category. Please let me be the one to throat punch the first person who says “God has a plan.” I clearly have some unresolved issues with this one, which should indicate how many times I heard it. I’m still not sure I’ll ever step foot in a church again. I love you, and I’m here WITH you. WITH you, not FOR you, there is a difference. Nothing. Just be there in silence. Fellow W’s, I’d love to hear some of the other helpful things people have said. And feel free to share the asinine comments too. I’ll be happy to commiserate with you. Oh, thank you Lisa! This is so good! 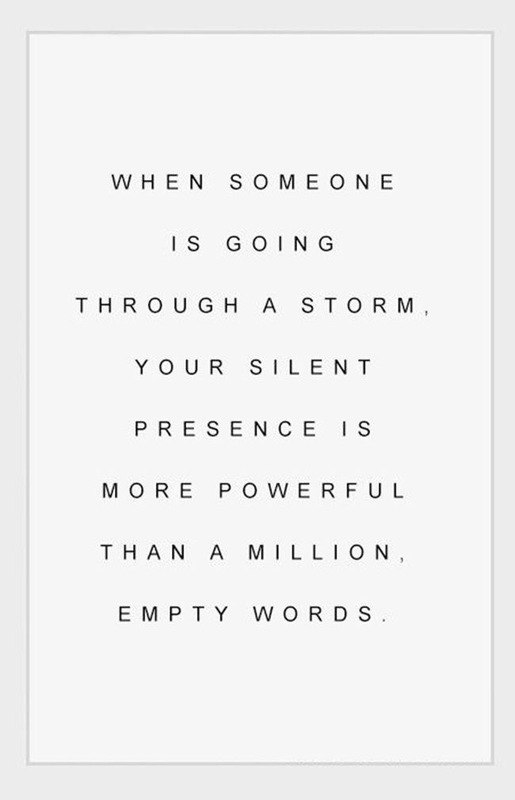 I’m afraid sometimes I say the wrong things… but I’m learning from you and others that sometimes it’s best just to ‘quietly sit by the bedside’ and let your silent, supportive presence be known. I am continually reminded of the simple words “Talk less, listen more…”.